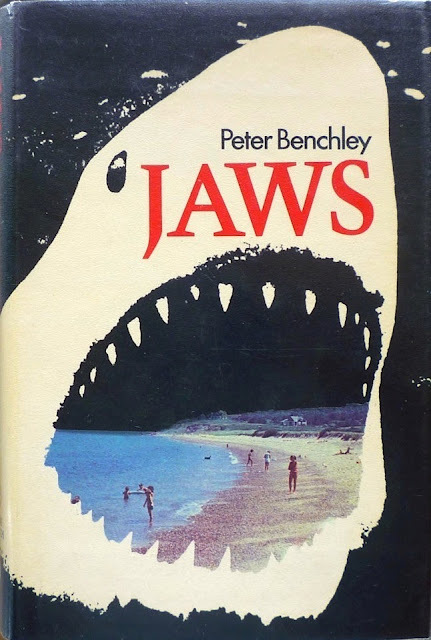 First published in Britain by Andre Deutsch in 1974 – the same year as the US Doubleday first edition – Jaws was American author Peter Benchley's debut novel – although not his first book; he'd already had a couple of non-fiction works published by the time Jaws arrived. 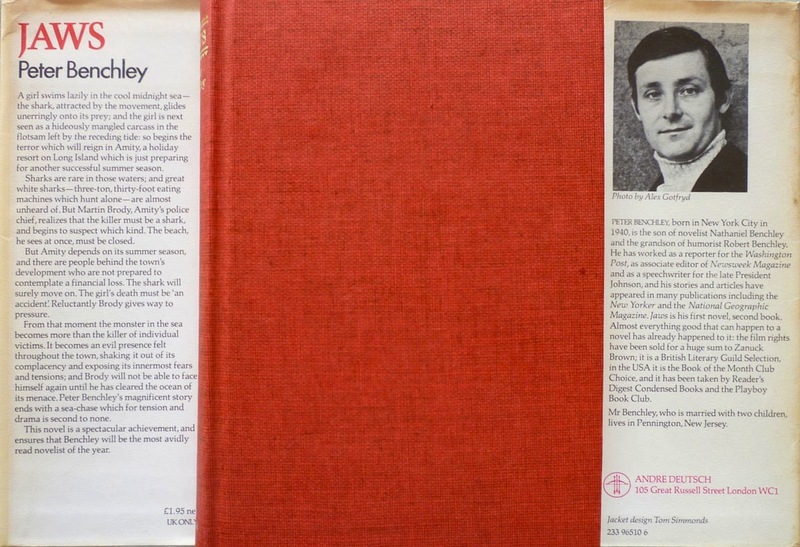 I found this Deutsch first edition/first printing at the Midhurst Book Fair a few months back, a snip at £9.50; copies of the Deutsch first edition/first impression (it went through multiple printings) can go for anything up to £100 – depending on condition – so I was rather pleased with this score. As for the book itself, I must admit it's bloody ages since I read it – I probably borrowed it from Beckenham Library decades ago, maybe even in this edition – and so I recall more about Steven Spielberg's film than I do the original novel. 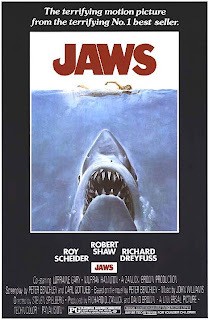 Certainly the memorable opening scene of Jaws the movie, with the shark savaging the hapless female swimmer, is lifted straight from the book, and the novel ends much as the film does, with Brody paddling towards the shore after his close encounter (ahem) with the Great White (although with one significant change). 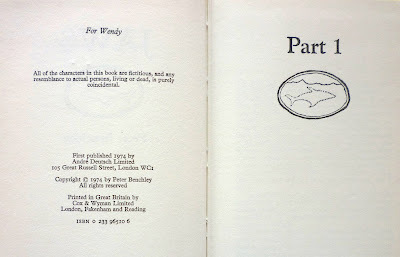 But I do remember it being a darker affair than the adaptation – for one thing, Brody and his wife, Ellen, don't get on terribly well in the book – and there being a subplot concerning an extramarrital affair which didn't make it into the movie. Handily, IMDB has a list of differences twixt novel and film, although be warned that by its very nature the list is somewhat spoilery. Yeah, did anyone really need to see Richard Dreyfus savagely screwing Lorraine Gary's brains out? Both characters were quite different in the novel, in looks and personality. Hooper got a more interesting personality in the movie--he went from being a tall muscular blonde WASP to a short kvetchy bearded Jew. Mrs. Brody went from being a major babe to a major bore. I actually don't remember much about Quint. I do remember the shark's ultimate demise was far less--bombastic. I remember reading an article in the NY Times magazine back then about how the book was marketed, particularly after the movie deal was signed. The novel was tweaked quite a bit prior to publication--it was very much being groomed for bestsellerdom. It was not a surprise hit at all, though the pop cultural phenom it became could not have been fully anticipated. 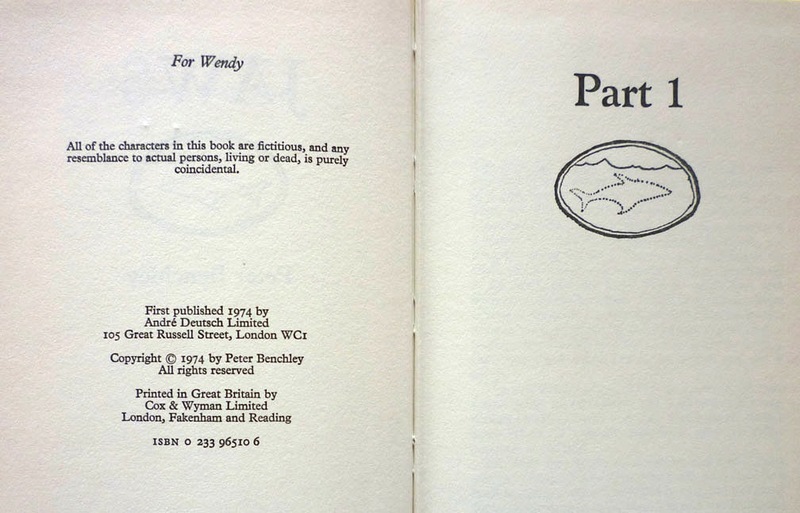 It was a classic summer beach novel, which happened to be set on the beach in summer. And as literature, it was never anything much. It does not read well today. The movie is DESERVEDLY better remembered. But sadly, in spite of a great script, and terrific performances, and even a bit of a social message, that really was where the blockbuster mentality sunk in, and studios began more and more to look for huge high-concept hits, and less and less for films that were individual creations. And probably the novel had something of the same effect on the publishing biz. The trends already existed in both industries, but they accelerated from this point onwards. Jaws didn't just eat bathing beauties. 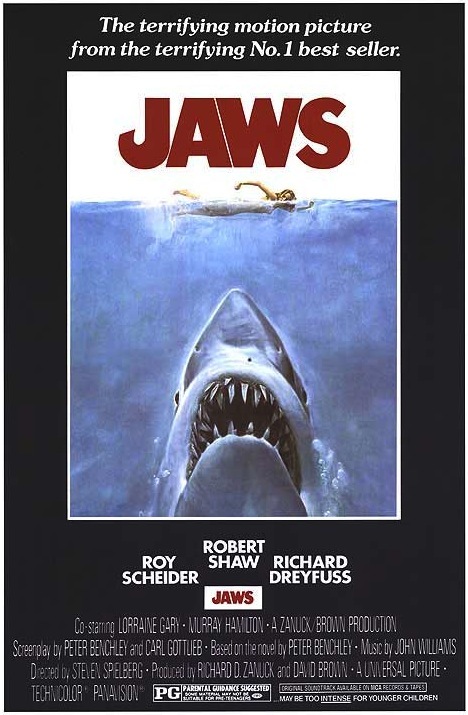 Jaws gulped down what was left of the notion that marketing came second to vision. Have you ever looked at yearly bestseller lists from the mid-20th century to today? Depressing. Though an overview of box office hits from then to now is no less so. I'm sure it occurred to you that "Butcher's Moon" came out the same year as "Jaws". Ta for the link, Chris. 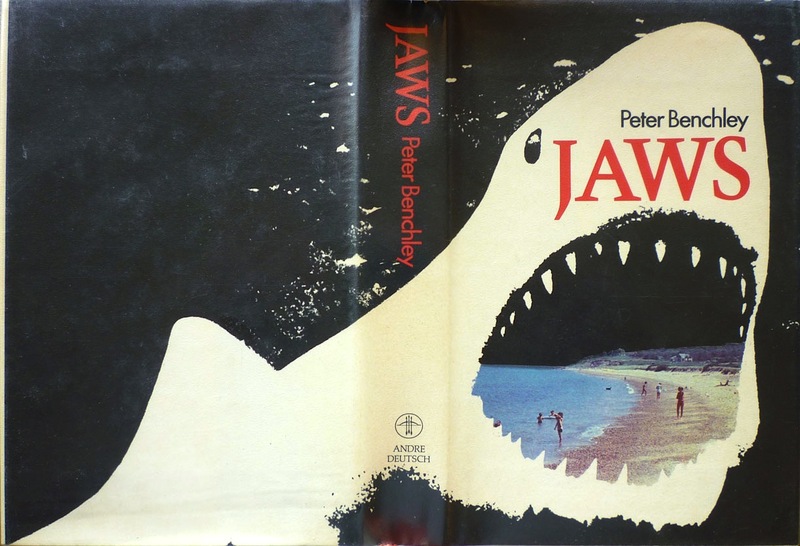 I was going to include the original US jacket for Jaws in the post, but decided not to in the end – and now you've saved me the bother! this post on Stephen King's The Dark Half in 2010. Have you got any links to US ones? Truly the first memorable movie moment of my young life--I was maybe 2 years old when it was released, and my teenage sister and her then boyfriend took me along to see it. I vaguely remember them making out and me sitting placidly UNTIL the shark appears midway. I wasn't sure what all the hubaloo was bout til then. When the guy's severed leg sunk to the bottom, I jumped out of my seat and ran for the exit! To this day, it's probably the only horror film--and yes, it was a horror film--that resonates in my psyche. I have nightmares occasionally and whenever I swim too far out, that theme starts playing in my head. I doubt there's a person alive who doesn't recall Jaws when they're swimming in the sea, David. As a friend of mine so aptly put it on Facebook the other day, it's enough to make you tiddle in your trunks. Did you see this BoingBoing post on the Jaws painting? It links to a story in Collector's Weekly. I hadn't seen that, no. Interesting. Ta, BG.